Chocolate Layered Zebra Mousse Cake. Happy FriYAY, we have a serious cake to talk about today. First though, happy Cinco de Mayo! I hope you will all be celebrating with a Mexican feast and plenty of margaritas tonight. If you need any ideas, check out this post! OK, but this cake? Isn’t is fun? As you can see I got just a little carried away with the edible flowers, but what’s new, right? And for those of you who are wondering, those would be hibiscus flowers, aren’t they pretty! 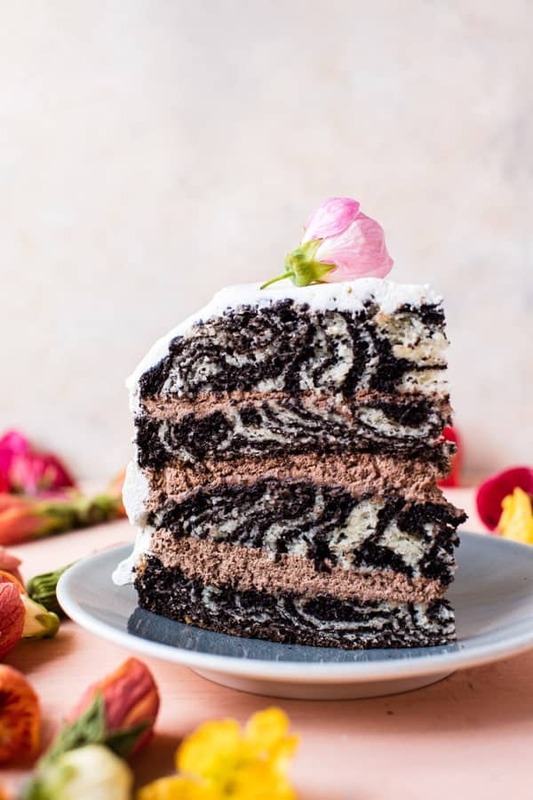 Zebra cake layers! Ahh! I’m still just in awe of this cake. And for those of you out there saying you could never make a zebra striped cake, trust me you can…and you should. When I set out to make this cake, I wasn’t real optimistic…I figured I could probably make it taste could, but look good…doubtful. 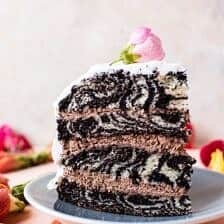 How would I get a cake to look like zebra stripes? Well, I took some advice from a pro, hello Martha Stewart, and you know what? Creating a zebra striped cake is simple and pretty painless. The secret? 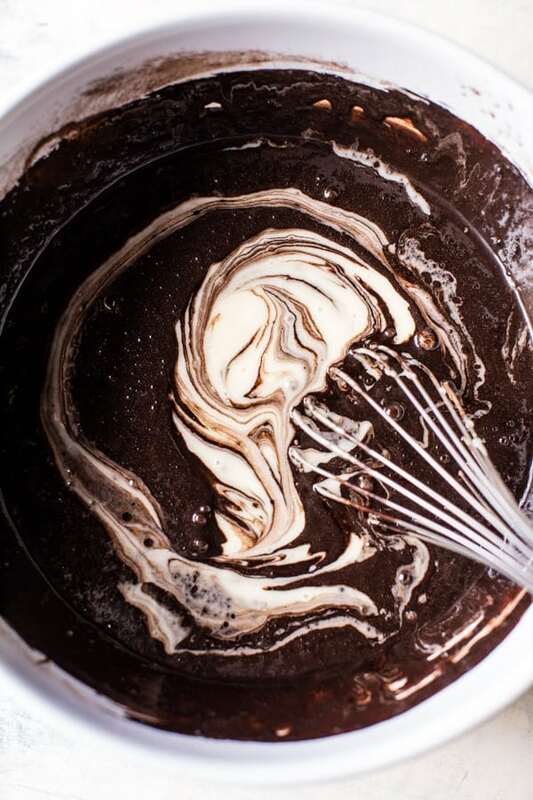 Simply pouring the chocolate cake batter over top of the vanilla cake batter, a little at a time, to create layers. 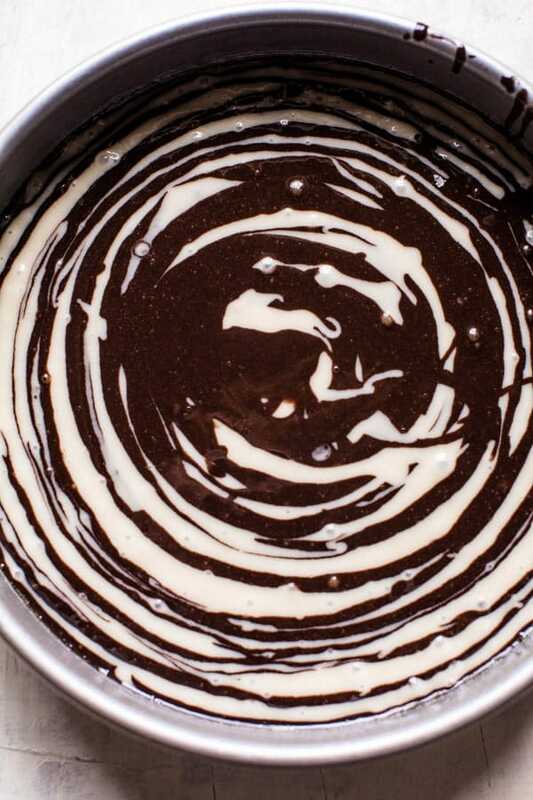 Yes, it does take a few minutes longer then just dumping the batter into each pan, but the fun zebra stripes make it totally worth the extra time and effort. I did a simple vanilla and chocolate cake batter, but for my filling, I went with something a little different. Over here, we are huge fans of anything involving chocolate mousse. I knew with Mother’s Day coming up in just a little over a week that I could create the perfect cake for my mom if it involved chocolate mousse. So that’s what I did. 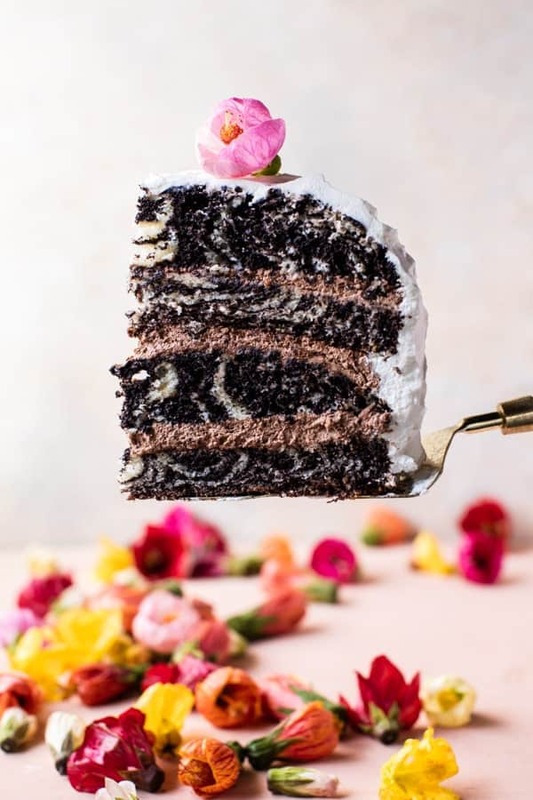 I created a zebra striped vanilla and chocolate cake with an easy chocolate mousse that’s light, airy and pairs perfectly with this cake. 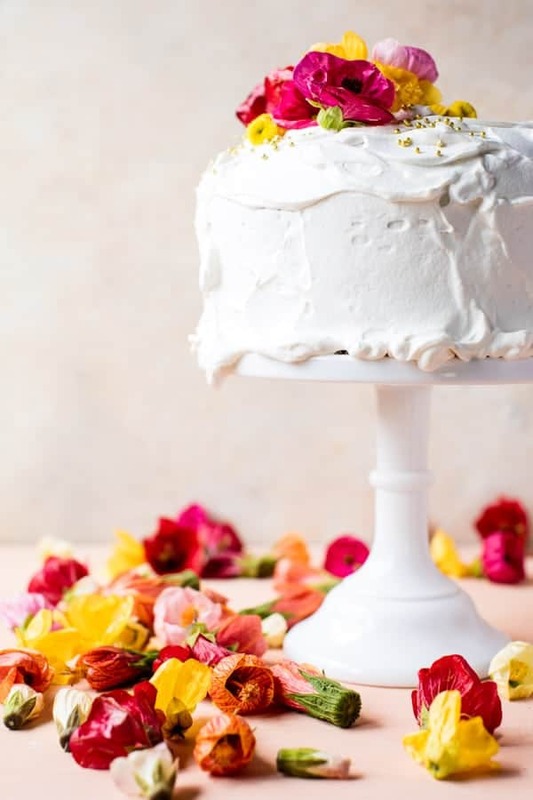 Then I frosted the outside with a little whipped cream and decorated the cake with tons of flowers, because anything with flowers is always my mom’s favorite…and my guess would be that’s the case for a lot of you moms out there too. Flowers just make everything better. You know what the best part about this cake is? Even though it’s super fun and pretty, it also tastes amazing. I feel like so many pretty cakes end up being dry and flavorless, but this cake is anything but…it’s moist, chocolatey, and airy – SO GOOD. Also, and I feel like this is something I really want to stress to you guys, DO NOT freak if your zebra stripes aren’t perfect, mine are totally not, but none of you mind, right? The cake is going to be fun no matter what, and promise, even if the cake batter looks like a hot mess going into the oven, by the time it comes out it will be pretty and zebra stripe…ish. And remember, perfect is just plain boring anyway. Little imperfections are always a good thing, they show character. OKok. And with that, I think it’s time to say see ya! I hope you guys all have an incredible cake-filled weekend. Are you up to anything fun? I’m headed to Salt Lake City to speak at my very first conference. I’m going to be running through my photography process with attendees and answering all their questions. And you guys, well I am excited, I am so nervous!!! So please, send good vibes! Zebra cake adapted from Martha Stewart. 1. Preheat the oven to 350 degrees F. Grease 2 (8 inch) round cake pans. 2. In a large bowl, mix together the flour, baking powder, and salt. 3. In the bowl of a stand mixer (or use a hand held mixer) beat together the buttermilk, greek yogurt, canola oil, eggs, sugar, and vanilla until smooth. Slowly add the dry ingredients to the wet ingredients with the mixer on low until there are no longer any clumps of flour. Batter should be pourable, but not super thin. 4. Divide the batter in half. Set one batter aside. To the other batter, add the cocoa powder and coffee, beating until smooth. 5. Spoon about 1/4 cup of vanilla batter (the one set aside) into the center of each prepared 8 inch pan. Now spoon 1/4 cup chocolate batter directly over the vanilla batter. Repeat this process, always spooning the batter into the center of the pan. It helps to tap the pans against the center every so often to evenly distribute the batter. Don't stress if things looks a little uneven. 6. Transfer to the oven and bake for 35-40 minutes or until a toothpick inserted into the center comes out clean. Let cool 5 minutes and then invert the cakes onto a wire rack to cool completely. 7. Meanwhile, make the mousse. Add 3 cups heavy cream to the bowl of a stand mixer fitted with the whisk attachment or use a hand held mixer. Whisk the cream until stiff peaks form. Add the cacao powder, honey, and vanilla and stir until combined and creamy. Cover and place in the fridge. 8. To assemble. 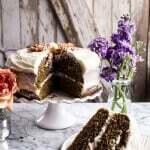 Using a serrated knife, slice the cakes in half horizontally. 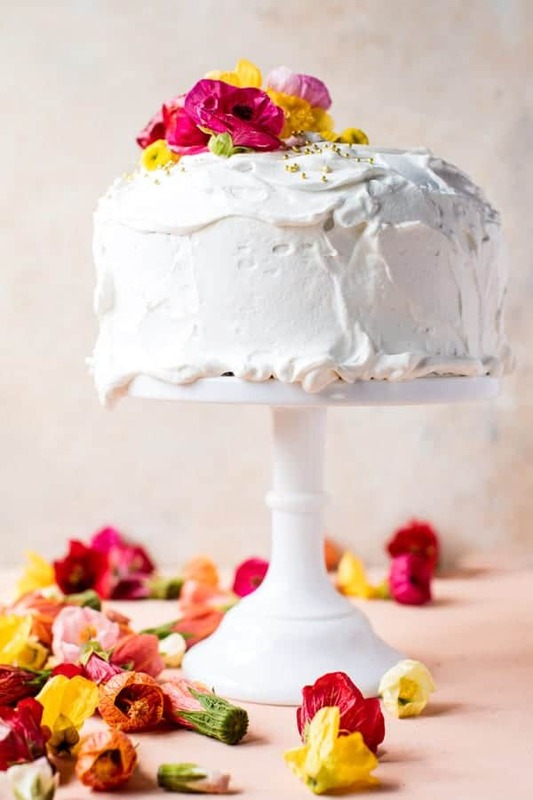 Place one cake layer on a cake stand and spread with mousse. Add another layer and then more mousse. Continue with the remaining 2 layers and mousse. 9. Add the remaining 1 cup heavy cream to the bowl of a stand mixer fitted with the whisk attachment or use a hand held mixer. Whisk the cream until stiff peaks form. Stir in 2 tablespoons honey. Spread the whipped cream around the outside of the cake. decorate as desired. Cake can be made up to 1 day in advance. Keep stored in the fridge until ready to serve. In the meantime, I’ll just be over here stress-eating on this cake. But for real, those layers! Love. 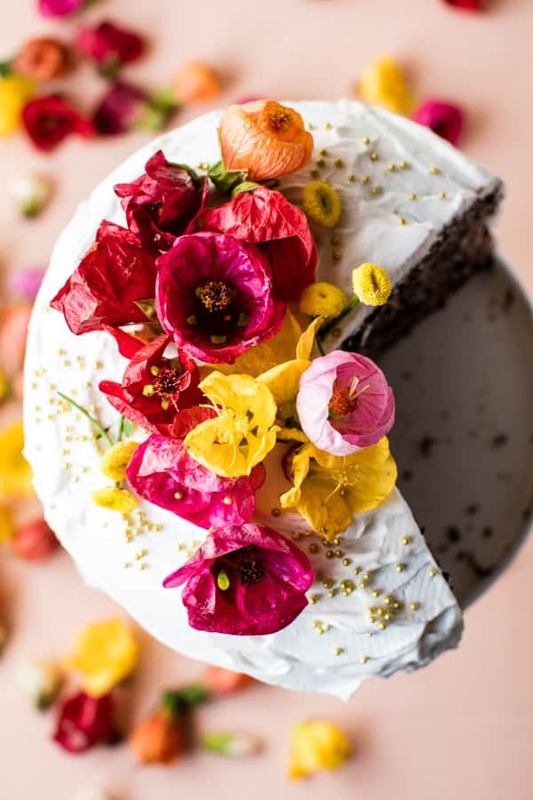 Super gorgeous cake; and sending you LOTS of good luck vibes!!! Thanks so much Liz, I seriously appreciate it! Hi Tieghan, looks amazing! But does the cake really have no sugar/sweetener in it at all? The only sweetness comes from the mousse? Just wanted to check before I attempt to make this. Thanks and good luck at the conference! Hi Linda! Thank you SO much for catching that. Yes, there is 2 cups of sugar and the recipe has been fixed. Hope you LOVE the cake and thank you! 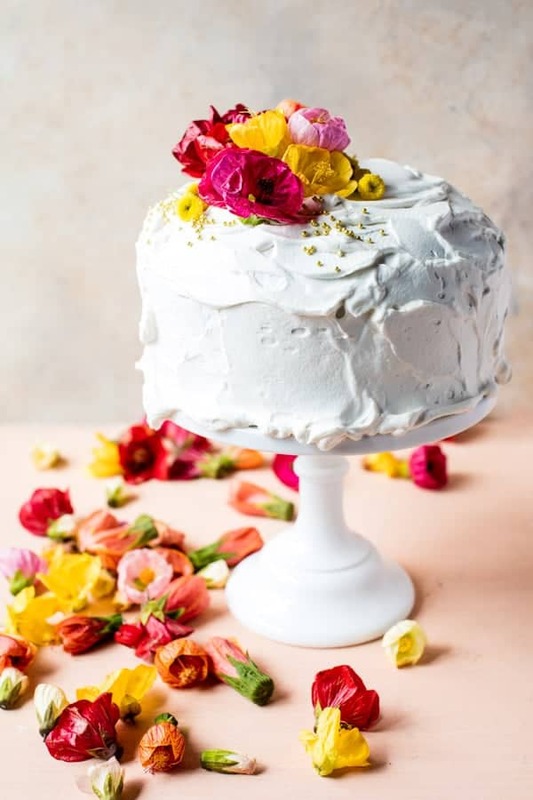 This cake is absolutely a beautiful, and I love all the frosting. 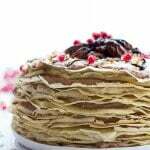 It’s the first time that I heard about Zebra cake and look so fun to make. You will do amazing in Salt Lake City; I wish I could be there to hear all about it. Happe weekend! Its SO fun to make! You have to try it. The first cut is so satisfying when you see it! Thank you so much I appreciate it! OMG!!!!! It looks so gorgeous!!! ANy mom would love to get this cake! I know I would!! Awh thank you Ruth! So happy you like it! The flowers look so pretty on the white frosting. I can’t wait for your cookbook to hit the shelves. Me too!! I hope you love it Mari! Now this looks like delicious work of art! Is there really no sugar in the cake? The Martha Stewart version has 2 1/2 cups. Also, yours looks so much taller and airier. Looks delicious! Hi Asa! Thank you SO much for catching that. Yes, there is 2 cups of sugar and the recipe has been fixed. Hope you LOVE the cake! I wish you could send a piece my way–it looks so good. I wish i could too!! You’d be first to get it Nancy! Thank you! 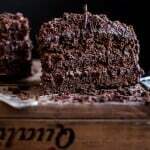 In the pictures, it looks like there is no mousse on the top layer of cake. So one-third of the mousse is used on each of three layers. Is that correct? Thanks. Good luck Tieghan!! I’m sure you’ll do great! Thanks so much Lindsay (: I’m gonna try!! Thanks so much Tricia! Thank you! Ahhh! 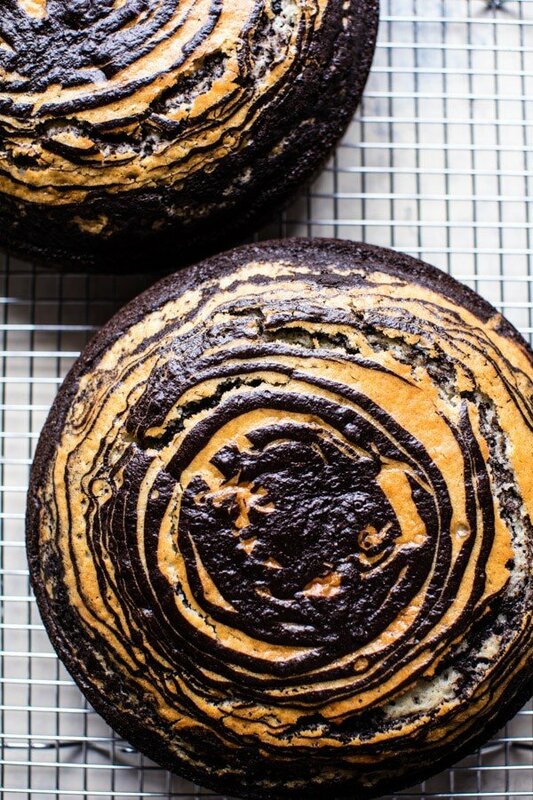 It’s like a zebra surprise cake. Love it! So gorgeous! Good luck with the conference – and pleeese tell us the details? What is the name? Im hoping that there might be a podcast coming out afterwards with your talk on photography – your pics are simply the best and I LOVE hearing about how you do them. Hey Daniela! I spoke at the Everything Food Conference in Salt lake City, Utah. It was so much fun and I hope to do more photography talks in the future, so I will keep you updated on those! Let me know if you have any other questions and thank you so much for the kind words! 🙂 Hope you are having a great weekend! This is SO gorgeous!! 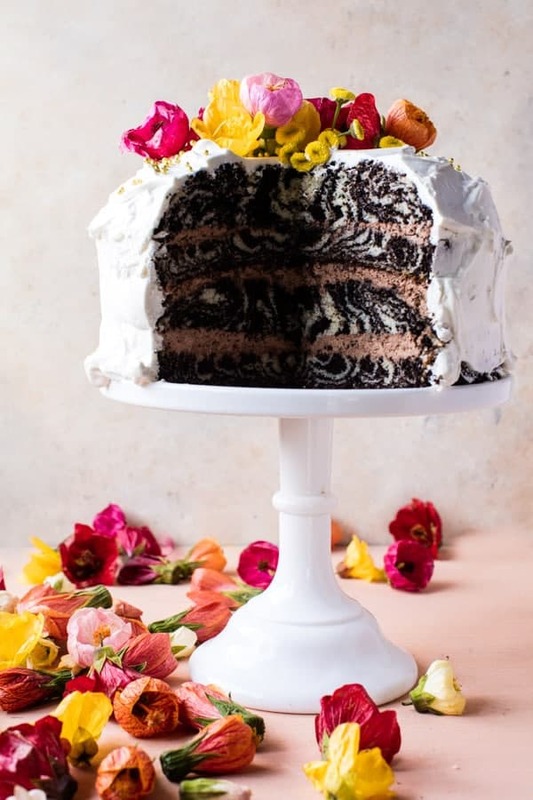 I love those flowers and the secret zebra stripes underneath that fluffy frosting! Thank you!! The stripes are so fun!! That cakes looks so CRAZY! It’s awesome! I know (: Thanks so much Jenny! Awh, thank you so much Meghan! So happy you like it! I wish you could! Thanks so much Caroline! Beautiful cake, Tieghan! And good luck with the conference! Thank you so much Anastasia! Teighan, this cake is so cool! Everything you make looks delicious and beautiful. :) Sending you good vibes for your first conference! Thank you so much Teresa! I think I need it haha! Hey Tieghan, this looks incredible! 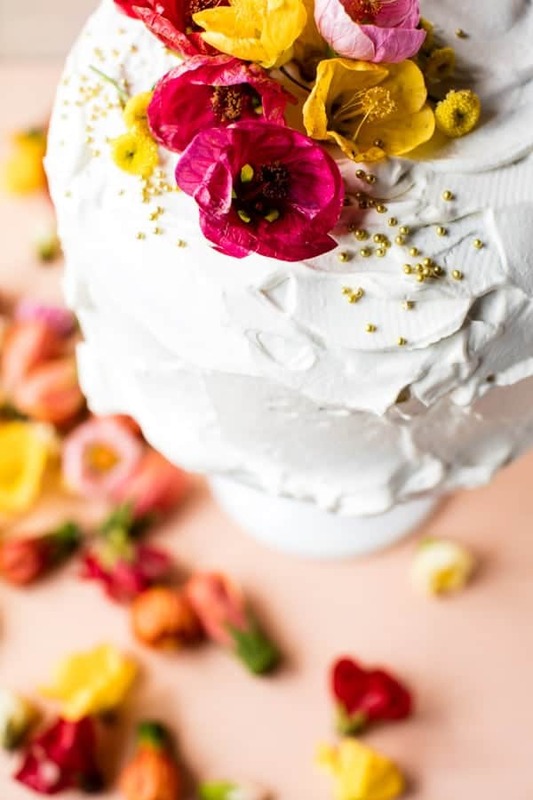 I love the look of all your recipes that use edible flowers. Where do you get/order them from? You did an awesome job at the conference, Tieghan! Never would have known it was your first conference appearance! Was so nice to meet you and as I told you, I’ve long admired your work. Great job! Hi! Is the black coffee a necessary item to the recipe? This would be perfect for a kid’s birthday cake, but not sure the coffee flavor will go over well. Advice would be great. Thanks! AH yes! Thank you Thalia! Hi! This looks absolutely amazing. Do you swirl a knife through the batter to the stripes effect or do you simply leave it as is after you’ve poured the layers? Thanks! Its so fun to make! Thanks Laura! Hey there! I made this cake this morning and it was both a bit too sour and a bit too dense. I want to try it again with cake flour and also was wondering if I could sub out one cup of the buttermilk with a cup of regular whole milk. Thoughts? It was BEAUTIFUL! Just wasn’t in love with the flavor and texture…. hey Renee!! Of course cake flour will be great and yes, if it was sour for you taste, use regular milk. You can also add a bit of sugar to sweeten it up too. Let me know if you have questions. Thank you! I want to tell you that I am so very impressed with all of the recipes on this website. The photography and the stories are such a wonderful pleasure. I am going to bake this cake because it looks so devine but I am not a baker, I am a home cook but I have to try this! Thank you for such a fabulous website! Yum! What could I substitute for the black coffee?? Substitute the black coffee with an equal amount of water! Delicious cake … Just imagining, mouth-watering. I will make! I hope you love this! Thank you! 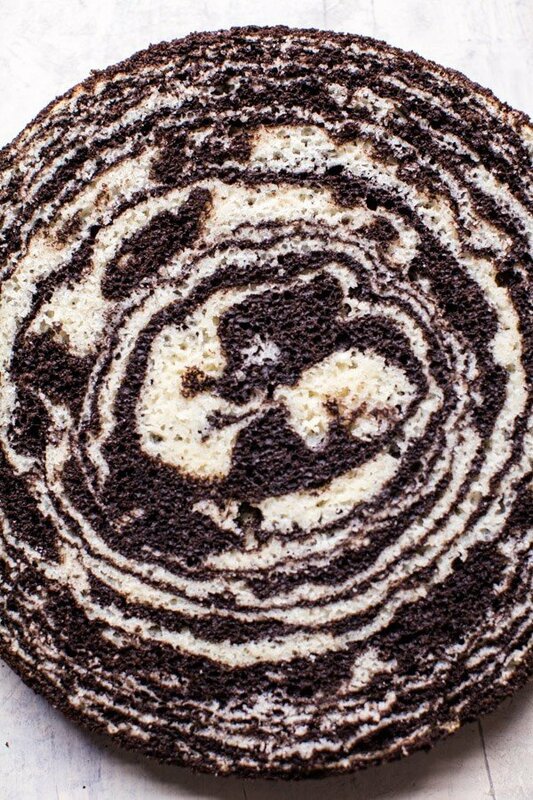 To get the swirl effect do you drizzle the chocolate layer or the cake or just evenly pour over it like a layer ?? I made this cake for my daughter’s high school graduation. I wanted to add a picture of the cake I made but not sure how 😕. It came out beautifully zebra stripped inside! I started the first scoop of layering with the vanilla batter. The coloring of the inside looks opposite to yours. Did you start with chocolate layer first? Either way looks great…just curious. I also did the opposite from you and didn’t use enough mouse for each layer. We ate the extra mouse and it was AMAZING! My cake is the density of pound cake, is that right? I’m a new baker. I will for sure make the mouse again for the fam. Thank you for the recipe! This looks so awesome! I want to try this for my birthday and i’m thinking about incorporating strawberries in between the layers of cake to give it a bit of a fresh kick. Now i really like the chocolate, strawberry chocolate combination, so do you think it is possible to replace the outer layer of whipped cream by coconut whipped cream (just the solid part of a can of full-fat coconut milk), or will it not be solid enough? My sister in law made this cake, and said it turned out dense and heavy for her. So when I made it,I used 3 1/2 cups of flour,and added 1 tsp of baking soda. Cakes are cooling now,and they look fluffy and light! Cannot wait to pile on the whipping cream and chocolate mousse,for tomorrow’s 30th birthday bash,for a dear friend. I am so glad this turned out amazing for you Savannah! Thank you! I made this cake this weekend and I have mixed feelings about it! I followed the recipe exactly; it was very simple to make and the zebra striping came out gorgeous. While I personally loved the taste of the cake, it was still rather heavy and “bread-y”? So when I went to put the mousse on, the weight of the cake kept making the mousse slide out of the sides. I made the cake part the night before and kept it in the fridge, so I know that it wasn’t an issue where the cake wasn’t cool enough. While I thought the taste and textures were delicious together, the weight of the cake and lightness of the mousse didn’t seem to work well together. In fact after the mousse debacle I ended up just using the rest of it (there was a ton) to just ice the cake all over; I felt too defeated to whip more cream for the outside. Lol. This might have worked better for me as a 9″x13″ cake with one big layer of mousse on top. Would it have been pretty? No! But, it is what it is. My family was raving anyway, so thank you 🙂 PS: I’m no chef like you, but I was also imagining this in a bundt pan with a light banana/confection sugar-y frosting drizzled over the top. If you can dream that up, let me know! Hi Kristen! I am sorry this did not work out the way you were hoping, but I am so glad everyone still enjoyed it! This cake turned out SO dense! Not ure what happened?? Should there be baking soda? Hi Renee, there is no baking soda in this recipe. Did you change anything about the recipe? Are there any details that you can give me in regards to how you made this so that I can help problem solve? Im planning on making this cake for a friend’s birthday but after reading comments I am a little worried it will be too dense. 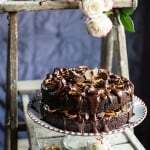 Do you think this cake would work using your vanilla batter recipe (https://www.halfbakedharvest.com/vanilla-birthday-cake-with-whipped-chocolate-buttercream/) and then just adding the cocoa powder and coffee to half of the batter? I did not know how important the batter recipe is for maintaining the zebra pattern! I made two versions of this cake since some commenters mentioned the cake was too dense. One version I followed the recipe exactly and the other version I substituted cake flour and added baking soda in hopes to get an airer caked. In the end, I found the recipe to be perfect the way it was. I agree that the cake does have more of a “poundcake” consistency but I think it works really well because the chocolatey- flavor isn’t very strong. I plan on adding raspberries to each of the layers when I make this cake for a birthday party this weekend. This cake is definitely a showstopper! can i please know how to make exact butter milk?